A list of some of my most used and favourite ingredients and the reasons why I use them, and why you should, too! With a Japanese granny, miso is a must in my fridge. It’s made from fermented beans (usually soybeans) and it transforms whatever you add it to with incredible umami flavour. You can get it in loads of varieties in most supermarkets and in any asian market- find one you love and always have it in the fridge. Tahini is basically sesame seed butter and it’s a staple in my kitchen. I use it in sweet and savoury recipes and usually go for light tahini as the flavour is more versatile. If you can get a real Middle Eastern tahini, it makes all the difference- my favourite one is Al Nakhil. Harissa is one of my favourite condiments. It’s an oily chili paste, full of spices and herbs and is a great way to add flavour in seconds. Use it in dressings and sauces or simply toss some veg or tofu in it before roasting. It varies a lot so try a few and find one you like. Nutritional yeast is another wonder ingredient for boosting flavour. I use it in dressings, sprinkled over veg before roasting and for adding a ‘cheesy’ flavour to sauces. You can get it in any health store. I am obsessed with vanilla powder, it’s my favourite secret ingredient. It’s made from ground whole vanilla pods (and nothing else) and it has the most incredible, powerful vanilla flavour that’s just so delicious. It really intensifies the sweetness of whatever it’s added to and smells amazing. It can be hard to find so I order it on Amazon. Cacao powder comes from the cacao bean and is raw, unprocessed and extremely rich in nutrients. It’s an excellent source of essential fatty acids, fibre, iron, copper, zinc, magnesium, calcium and sulphur. The first tip I always give for cooking at home is to have a well stocked spice rack. Spices create deep flavour instantly and are the foundation of most of my recipes. My favourites are paprika, garam masala, cumin, cinnamon, ground coriander and turmeric but you can never have too many. Tinned beans and legumes are the best- they’re already cooked so there’s no need to soak and simmer for hours and they are incredibly nutritious, full of protein and fibre. To make them easier to digest, make sure to rinse them well (until the water runs clear) before using them. When you have more time, dried beans and legumes are so delicious, however they require soaking and a longer cooking time. I always have tinned tomatoes in my cupboard. Add some onion, garlic and lots of spices and you can always make a meal out of them. I usually go for Italian ones as they have the best flavour. I love coconut milk’s luxurious creaminess in curries, soups and desserts. I use full fat, tinned coconut milk. Often, my recipes call for coconut milk that’s been in the fridge overnight, this is a way of separating the cream from the liquid and leaves you with a layer of amazing coconut cream, which is heaven in desserts. Coconut yoghurt is a dream- it’s so creamy and thick and I love it for sweet and savoury recipes. You can get it in most supermarkets (my favourite brand is Coyo). I adore the rich flavour of sesame oil and use it in lots of savoury dishes. I get mine in my local asian market. You can also get it in most supermarkets. Coconut oil is the perfect plant based alternative to butter. It adds a gorgeous lightness to baking and its subtle aroma doesn’t overpower other flavours. It has antimicrobial properties and is full of healthy saturated fats. Olive oil is my go-to every day oil. It’s the starting point for a lot of my recipes and has such a versatile, delicious flavour and is full of healthy fats. Tamari is like soy sauce but it’s a tiny bit richer and doesn’t contain any wheat so it’s usually gluten free. Look for a certified gluten free one if you are cooking for celiacs. 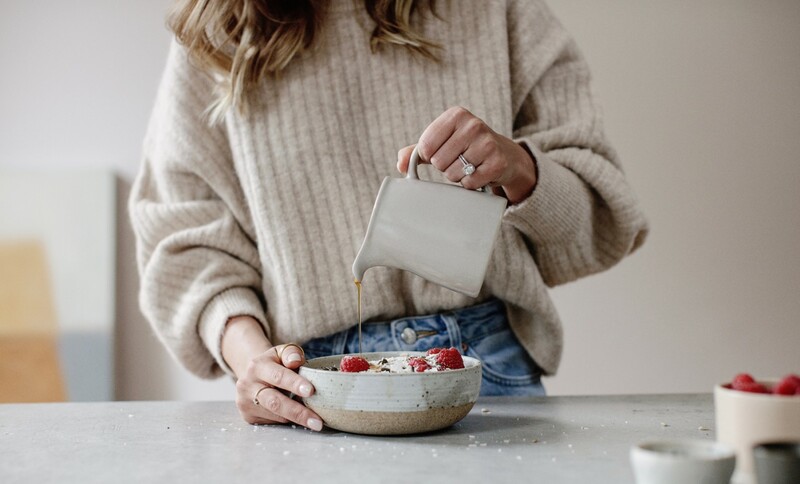 I use plant milks (I mainly use oat milk and cashew milk) every day for everything from my morning coffee to cooking and baking. When buying them, stick to the unsweetened and unflavoured kinds and look out for brands with no preservatives. Porridge is one of my favourite foods but I also use oats a lot in baking. Oats are naturally gluten free but often they are contaminated by other grains so I always opt for certified gluten free oats. I use them whole and as flour- you can buy oat flour or easily make it at home by blending oats in your food processor until fine. You can find gluten free oats in all supermarkets and gluten free oat flour in most health food stores. When cooked right, quinoa is gorgeous and fluffy with a slight nutty aroma and it absorbs sauces and flavours incredibly. My fool-proof way to cook it is to use a 2:1 ratio of stock to quinoa, then simmer it on medium heat with the lid on until all of the liquid has evaporated. I love using ground almonds as a nutritious swap for flour in some recipes. Almonds are a delicious source of vitamin E, calcium, magnesium and potassium and they’re also rich in protein, fibre and monounsaturated fats. Chickpea flour (aka gram flour) is incredible. It has a really unique texture and works really well as a binder. It’s gorgeous in things like fritters, makes delicious savoury pancakes and even makes a mean vegan ‘omelette’. You can get it in any good health store or asian market. Aquafaba is essentially just the water that chickpeas have soaked in but it is seriously amazing. It can be used to replace eggs in baking and I use it in loads of my favourite recipes (shout out to my nut butter blondies). It can be whipped into peaks to replace egg whites or used unwhipped to replace eggs as a binder. You can make it yourself by reserving the water you’ve cooked chickpeas in or you can simply use the liquid from a tin of chickpeas. I love baking with buckwheat flour and it makes the best pancakes. It’s naturally gluten free so it’s great for anyone avoiding gluten. Coconut sugar is loaded with vitamin C and amino acids and it’s a great, slightly more nutritious substitute for white sugar. It barely tastes like coconut at all and has a gorgeous caramel flavour. Pure maple syrup is my favourite liquid sweetener. It has the most incredible flavour and contains some vitamins, minerals and antioxidants. Dates are high in fibre so they’re great for digestive health. They’re full of essential nutrients, minerals and vitamins such as Vitamin A, iron, magnesium, potassium and calcium. I use them in my recipes as a natural sweetener, adding a gorgeous chewiness to baked goods. I use a high percentage, dairy free dark chocolate in my recipes. Nobo and Ombar are two of my favourites. Use your favourite but my recipes are best with chocolate that is at least 70%.